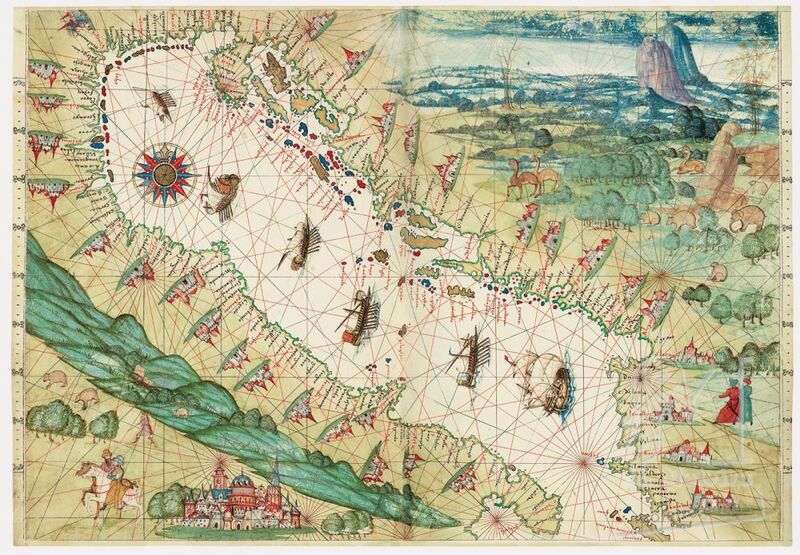 Map 14 provides a detailed representation of the Adriatic and is the only map in the Atlas where the North is at the top of the page. It is oriented according to the magnetic North and, unlike all the previous maps, it does not show the latitudes. Judging by the toponyms it appears to be a copy of an Italian chart, more precisely perhaps a Venetian chart. The Dalmatian toponyms are Venetian and not Slavic. Symmetrically balancing the representation of the preceding map, the Italian Peninsula is depicted here without its western coast, which allows the illuminations to extend to the edge of the map, beyond the Apennines, symbolised by a string of hills. Apart from the realistic design of five galleys and a carrack sailing in the Adriatic Sea and the conventional images of walled cities, the iconographic programme is quite fanciful, since, apart from numerous bears scattered almost everywhere, it depicts camels and elephants on the Balkan Peninsula and Turkish horsemen at the heart of Italy, even next to a fantastic city that is perhaps meant to represent Rome.